In this inaugural edition of our blog, maybe the first question we ought to answer is Why do this; why launch yet another blog in a space that is already overwhelmed with competing opinions and a lack of consensus on so many basic issues? One reason is precisely because of the multiplicity of opinions regarding outcomes, the need for them in the work of nonprofits (and government, and philanthropy…). On one side, there are those who suggest that because of the historical lack of a focus on outcomes, there is scant evidence that the work of most nonprofits has made any discernible difference at all on the multiple problems these organizations exist to address. Additionally, there are some who suggest that those pushing for outcomes in the work of nonprofits are missing the point, or –worse- that an insistence on outcomes as a measure of effectiveness is a wrong-headed approach that will only move nonprofits to focus on those things that are the easiest to solve. On the other side there are those who, like us, believe that a focus on outcomes and performance is ultimately the only valid measure by which nonprofits can and should be assessed, that the debate currently taking place regarding the place of outcomes is literally nothing less than a battle for the soul of the sector. Yet this belief, we need to point out, is tempered by a healthy dose of reality, by a recognition that, in the scheme of things, the focus on outcomes is a relatively new phenomenon, and by an awareness that many of those very institutions now asking for outcomes (Are you listening, foundations and governments?) have done precious little by way of enabling nonprofits to meet this demand…either by offering the resources and guidance on how to do it, or by providing the wherewithal necessary. We recognize that the ability to focus on, achieve, and report on meaningful, sustainable outcomes may not come to the best of nonprofits for a few years yet; and for the rest, the achievement of that goal may be even more years off. We intend this space to be a forum for debating not only how outcomes can and should be applied to the nonprofit (and governmental, and philanthropic…) world(s). Beyond this, we want this to also be a place for new ideas, perspectives, and tools to be presented and discussed. Is there a place, for example, for a powerful tool such as Six Sigma in any but the largest, most resourced and capable on nonprofits? Can other tools regularly utilized in the for-profit world, such things as Value Engineering and SERVQUAL or FMEA analysis be adapted and adopted by nonprofits as ways to take a look at that they’re doing and gain insights on improvements they might make? Are outcomes an idea that is only applicable to the nonprofit/charitable/NGO reality of the U.S., UK, and Canada, or can nations with differing value structures and traditions –Russia, Western and Eastern Europe- profitably use them as well? Can they be, should they be applied to rapidly emerging nonprofit setting such as India and China? Is it too early or too late to apply these ideas to the settings of Latin America and Africa? Can government agencies, constrained by legislative and executive policy (and civil service rules) successfully implement an (outcomes) approach that might appear to fly in the face of both tradition and the-way-we-do-things-around-here? We’d like all these questions to be debated here. Finally, we will continue to look beyond the usual boundaries of the nonprofit (and governmental, and philanthropic…) worlds for nontraditional perspectives and sometimes oddball ideas about where the nonprofit world might look for inspiration and insight. Having long been a proponent of outcome measures, I will share why. Setting goals, and measuring progress toward goals is how business is conducted. the days when a firm could “fly by the seat of their pants” without data collection and knowledge management are long gone – if they ever really existed. There is definitely a place in nonprofit management for lean operations such as Six Sigma; quality standards such as Malcolm Baldrige; and accreditation such as JCAHO and WASC. Smaller nonprofits with a vision to become large firms are best positioned to achieve said vision if they impelment metrics, plan their route, and work toward goal attainment..
As I could go on and on, allow me to conclude I look forward to discussions on this blog – your first post was thought-provoking and engaging. Thanks, Terri, and welcome to the Toolbox. I am especially excited by your comments regarding the place in nonprofit management for such ideas as Six Sigma and other corporate-based tools. 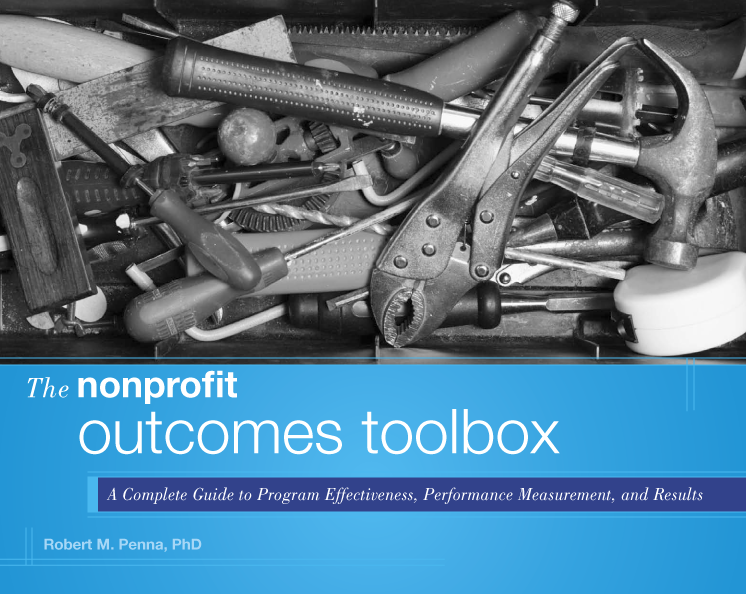 You might want to check out parts 3 & 4 of my book, The Nonprofit Outcomes Toolbox, for a discussion of applications of a number of these frameworks to the nonprofit setting. FYI, you can get it at Amazon, B&N, and many other on-line booksellers. Please check back regularly. Although only one blog, Penna’s Perch, has content as of today, I plan to add content to the other two, The Outcomes Observer, and Around the Toolbox within coming days. This blog will feature opinion, debate, and the occasional bomb-throwing. The Observer will feature news from around the outcomes world, and Around the Toolbox will feature items from the book. Thanks, C.T. One step at a time…. Thanks, Mario. I intend to open this debate as widely as I can. I want to keep it interesting and get as many people engaged as possible. i appreciate your taking the time to visit, and hope you’ll check back frequently. So measuring outcomes is necessary but it is insufficient, we need some principles for what is to be measured, how and how to assess relative importance. These should both guide our professional judgement about what is reported and offer some assurance to our audience. The SROI Network has developed seven principles and a standardised methodology, assurance for reports, accreditation for practitioners and membership for anyone who supports the movement of Accounting for Value. The SROI Networks mission is to embed the use of principles of SROI in public, private and social sectors. You raise many other interesting points and I look forward to the debate. Thanks for the thoughtful comment. You raise several interesting points. First off, as to reasons not to use outcomes, apologists of the status quo offer many such reasons. I believe many are based in either fear of looking bad should actual results (or a lack thereof) be seen, or simply not wanting to be bothered. For decades many in our sector have gotten by with simply pointing to the enormity of problems to be addressed or at how “busy” they are instead of showing what –if anything- they are accomplishing. We need a mind-set shift in the sector and I count on people like you to help bring that about. Your mention of standards for measuring is interesting, as is your reference to the SROI Network. I promise to look more deeply into both and report in these pages what I find. Interesting blog and excellent addition to the process. Maybe with more resources like this, and more people advocating for change, we’ll be able to see some change. It seems so logical to operate in a manner where you set goals, develop a plan, identify indicators/milestones to measure progress, collect relevant info, and use this info to learn what’s working and what’s not working so you can make adjustments and continuously improve. Just think about what you do if you want to lose weight. Yet in addressing our world’s most pressing social issues many just wing-it. In my opinion, the reason for winging-it is that doing it right is hard, time consuming, and requires resources that many nonprofits lack – and that many funders don’t seem to be willing to fund. Perhaps if funders understood the potential harm and opportunity cost of giving to organizations that wing-it then maybe the funding stream would change. We need to stop giving to those who are just good at telling heartwarming stories, developing the right relationships, and having a recognized brand. Instead, lets give to those who can tell you about the mistakes they’ve made, how they identified them, and what they did to rectify their mistakes. I’m confident that one day this will happen. 1. Why don’t more nonprofits use outcomes measurement? 2. What are investors doing to help the process along? You are right on target in saying that it is harder than simply winging it; and that it requires resources that many nonprofits lack. To this I think we also need to add the fact that, until recently, few voices were asking nonprofits to not just wing it. Going back to the beginning of the last century there seemed to be an almost Field of Dreams attitude toward social investing. But rather than “If you build it he will come,” it was “If we spend money/make services available, things will get better.” It was not only simplistic, but it was emblematic of the time, reminiscent of the prohibitionists who thought that by outlawing alcohol all the attendant problems of the underclass –domestic violence, crime, ignorance, broken families- would magically disappear. Adding to this was a culture whereby nonprofits could point to the enormity of the problems to be addressed (those requests you get in the mail featuring starving kids or puppies) or tell their audiences how busy they were or how much they cared in order to be funded. Frankly, for decades the question was Why bother with outcomes and proof of actual effectiveness if the audiences were not asking for them? Sadly, those underwriting many of these efforts, both governments and foundations, have been all too complicit –if not downright disingenuous- in this situation. Even now, while asking for outcomes in grant proposals and reporting, most do not provide the dollars needed, not only for results to be tracked and documented, but for nonprofit staffs and leadership to learn what they need to know to use these ideas effectively. This is a great blog Bob, thanks for the linkedin invite. This is a well thought out article that I have bookmarked for future reading. Thank you for creating this discussion. Your and other’s information continues to provide assistance in the non profit faith-based community. In this arena, similar issues exist. There definetly needs to come a clear understanding of the need for a balanced spiritual and business approach when running these type of agencies. Measuring out comes, quality of ministries, accreditations and striving for improvement are part of taking on this approach. The bottom line is people give their trust, money and attendance while the non profit faith-based organizations should be responsible to give the faith message and an opportunity to become part of an extended community. Using an outcomes approach improves this process by providing the proof that the ministry work is being completed with excellence ( by the way this is a biblical principle also). Thank you for creating a space for this needed information. I am glad you are finding the discussion useful, Michele.